DID YOU KNOW THAT SOCIAL SECURITY IS A PONZI SCHEME AND TODAY’S RETIREES WERE CONNED. BUT INSTEAD OF DEALING WITH THE CONSEQUENCES OF THEIR MISTAKE, THEY’RE PASSING THE LOSSES ON TO THE CURRENT GENERATION. WALL STREET BUILT THE OBAMA CABINET - Michael Froman, a former Citibank executive single-handedly built the entire cabinet of what was supposed to be the “main street” President. WIKILEAKS’ RELEASED EMAILS REVEAL GREAT CHUMMINESS AND COORDINATION BETWEEN DEMOCRATS AND THE SUPPOSEDLY “OBJECTIVE” NATIONAL PRESS. 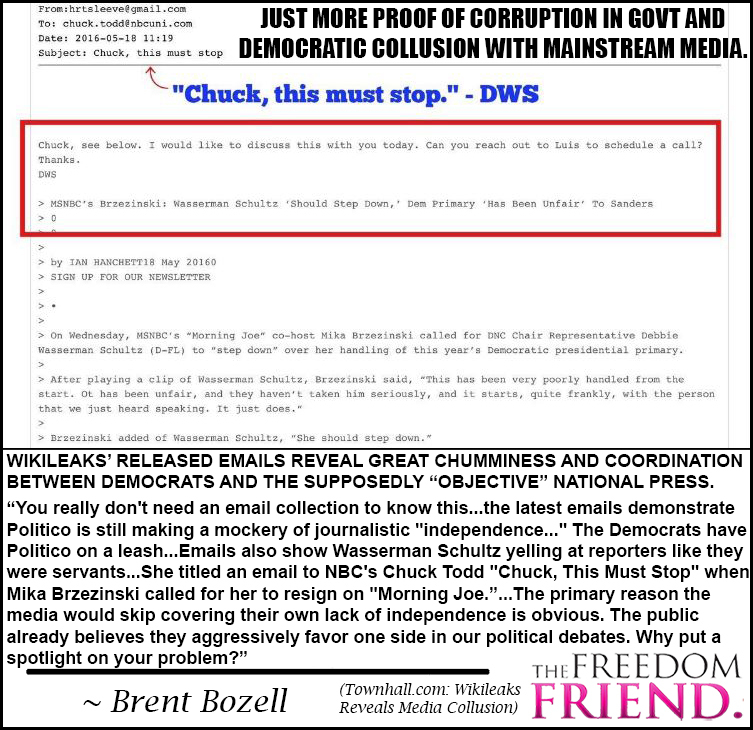 “You really don’t need an email collection to know this…the latest emails demonstrate Politico is still making a mockery of journalistic “independence…” The Democrats have Politico on a leash…Emails also show Wasserman Schultz yelling at reporters like they were servants…She titled an email to NBC’s Chuck Todd "Chuck, this must stop” when Mika Brzezinski called for her to resign on “Morning Joe.”…The primary reason the media would skip covering their own lack of independence is obvious.